Michael Singer Studio has been providing the Sterling and Francine Clark Art Institute with environmental and design consulting for a site specific sculptural piece as part of their multi-year campus redesign effort lead by Japanese architect Tadao Ando. The Studio’s work is focused on a sculptural interaction that is integrated with the Clark’s new water systems including a massive reflective pool that doubles as a winter ice rink. 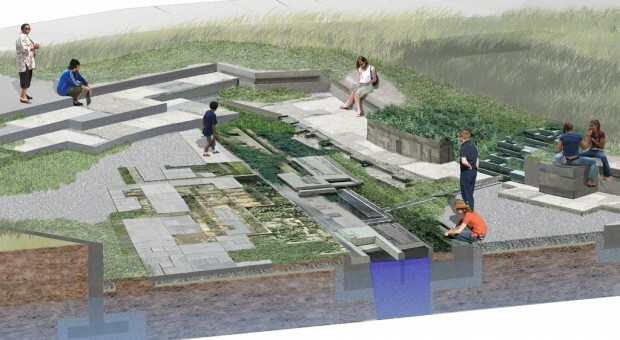 Through the conveyance of water, the interaction will physically and conceptually bridge the constructed man-made system (the reflecting pool) with the natural systems (wetlands and ponds) on site. The sculptural interaction is currently being studied as a series of ground plane elements that promote water infiltration; visibly exposing the water returning to the soil. In addition the exploring concepts for the water interaction, the Studio’s work has found ways to add efficiency into the overall site water system. The Studio’s collaborative team efforts also include the establishment of interpretive trails within the Clark’s extensive woodland property and designs for an edible forest garden.